We’re surrounded by free Spanish lessons –- micro-lessons, that is. Here we are in Cusco, Peru. Just arrived five hours ago. The realization about the free Spanish lessons came into focus in Miami yesterday, where we spent about seven hours. Seven hours, you ask? Well, yes, though it wasn’t all contiguous. We arrived with sufficient layover for the three-mile hike from our arrival gate to meet my brother-in-law and our niece for a late lunch. (Those nice Miami people even have mileage signs posted for the hapless travelers scuttling through the construction maze from one terminal to another; take heart folks, Terminal E is only 19 more minutes away!) Then back to Terminal A for our flight, where we spent an extra hour on the ground – strapped in – while the airline retrieved the suitcase of a woman who didn’t show after she checked in her baggage. Can't be too careful. Airborne, finally. Briefly. But wait! The windshield is cracked. The captain thinks we should return the plane and get another. No vote, but we all agree. So what if we spend another 2-3 hours hiking to our new gate and jostling fellow passengers to get the $10 voucher for a snack, then vying for the available munchies around the gate? It's all an adventure. But I digress. Miami is truly a bilingual city, and the airport exemplifies that. Practically all the signs are in both English and Spanish. So if you didn't already know, entrada = entrance; salida = exit; and bienvenidos = welcome. Learning a new language starts even before we leave the country. Terry gives more ideas about learning a new language in your own country. Further, all the loud speaker announcements are bilingual. I listen carefully to the English, then even more carefully to the Spanish translation. These free language learning ideas can work for everyone. For a newbie learner, you try to pick out those words that are based on the same root word, like destinación (destination, of course). I know, I know; it didn't sound like it, but this is risk-free learning – no one's the wiser if you missed it the first five times. Back to the translated signs . . . some are complete sentences and paragraphs that give you an introduction to learning a new language by allowing you to study the composition of sentences and ferret out new vocabulary words. Take this from a sign on the plane: Abroche el cinturon al estar sentido. Translation: Fasten seat belt while seated. Hmmm. Abroche must mean fasten. A command ending with an e . . . Must be an –ar verb. But it doesn't sound like a regular verb . . . Will have to listen for other uses of the word. Find out more about how to learn Spanish grammar here. Cinturon I recognize as something to hold up your pants; guess it applies to holding you in your seat, too. I also recognize the final three words – "at to be seated" – though I wouldn't have known how to put them together. Stash that in memory, too, and watch for other free language learning examples. If you'd like to try the same techniques we're using, we recommend that you download the Walkabout Language Learning Action Guide. It will show you how to create your own tailor-made language learning program. OK. Enough of the free Spanish lessons for today. After the delays in Miami, we didn't arrive in Lima until 2 am. Hotel by 3, sound asleep by 3:15 – a 24-hour day. We were up yesterday at 2:30 a.m. This morning, we were up again at 5:45 to catch the plane to Cusco. I could really use some zzzzzzzzzzzzs. Learning Spanish might just save our lives! Learn Spanish ... or die? October 8 update: A few zzzzs under my belt give enough energy to capture a free language learning lesson. We spotted several signs during our visit that are too good not to share. 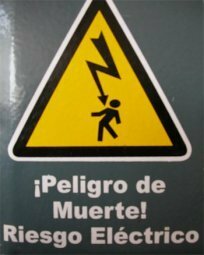 The one on the left was on an electrical box; the image is pretty vivid, and we quickly ferreted out the words peligro "danger" and muerte "death." The one on the right seemed pretty easy too. Zona must be "zone" and we remember segura from our high school Spanish classes, "safety" and en caso sounds pretty close to "in case." 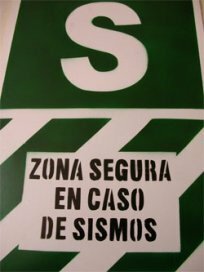 Sismos is not a word we've ever seen, but it is sounds like the root of the word "seismic" which has to do with earthquakes. Ha! This must be an earthquake shelter.